We have been very busy this year with the free Humane Society clinics for 100 feral cats once month. To get 100 cats to these clinics, about 130 cats need to be scheduled. Of course every spot must be filled so Suzie and I usually swing into action. 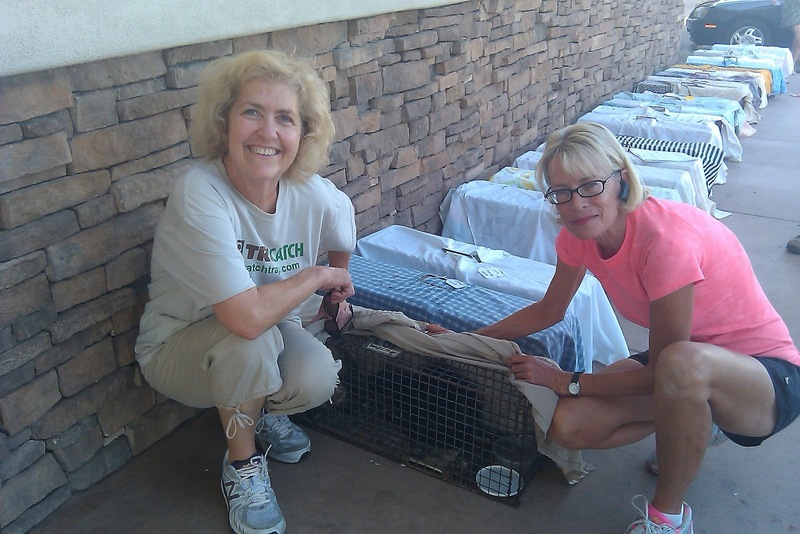 The photo below is of us checking in a colony of 28 cats Suzie trapped at a mobile home park in the W. Valley for the AHS clinic on 30 April. These were the result of a second night trapping from Saturday's clinic where we had in 23 cats for a total of 51 cats at this park. I also trapped 23 cats for the 30 April clinic and eight cats for the following day for a total of 31 cats in this colony! A total of 82 cats TNR'd in five days. Most importantly, there will be no more kittens born in these colonies. Well, why do I do this? I do it because there are too many cats and not enough homes for them. Most who love cats already have too many cats (like myself). We are trying to solve a problem that is epidemic in Maricopa County. How much easier it would be if people fixed their cats...I realize many cannot afford to and cats just "find them". Those that know me know I am a champion of personal responsibility yet I work daily with those abdicating their Ms (that's a philosophical argument for another blog). Most want "someone else" to fix their problem like taking the cats away or finding homes for them. Still it is like putting acid on a wound but I continue to punish myself in hopes that someday free-roaming cats being fed will ALL be fixed. Some ask...what are you trying to prove? My answer is nothing. I just someday want to be able to justify purchasing my beloved pure bred Singapura cat - without feeling guilty! Enough of rambling from my soapbox. The photo below is a one I took while while recently trapping with Carla at an apartment complex and trailer park. We trapped about 40 cats. This is the quintessential photo of where we spend at lot of time trapping. Not sure if you can see the sign in this photo but it says "please do not throw trash on the ground". Cats love trash and this was the perfect place for them - a magnet for feral cats. I can picture them living in this couch - perhaps even having kittens inside! When I am looking for free-roaming cats, I often look in such places. I remember the last day of 2008 trying to break the yearly goal, I went to the trusty coach down on Indian School Rd. to get more cats - always a sure thing. I've been doing this since 2004. As I drive by areas of town I now see LOTs of places I've been over the last eight years and I see ear-tipped cats. I also get calls from or stop by previous caregivers I've helped and the number of cats has diminished substantially. Many have died which saddens me. Yesterday, I stopped by to visit one elderly gentleman and he was down to about six cats - and we had fixed over 20 cats there. This tells me TNR works! So what can you do to help me make my job easier? Encourage people to fix their cats. Recommend trap-neuter-return (TNR) for cats they might be feeding outside. If they need help, offer to help them or donate for them if they do not have any money. Spread the word in your "sphere of influence" about the importance of spay and neuter. Facebook is a good place to start.